JUNEAU — Alaska’s fiscal cliff is here. At 10:30 a.m. Wednesday, Gov. Mike Dunleavy will unveil his budget, a document containing $1.6 billion in cuts that will likely affect every resident of the 49th state. In order to balance the budget while paying a $3,000 Permanent Fund dividend without new taxes, services will be reduced or eliminated entirely. The impact is expected to fall heaviest on health care and Medicaid services. The details of the governor’s budget will not be released until Wednesday, the deadline to present budgetary changes to the Alaska Legislature, but the scope of the governor’s plan is known. In an extended interview with the Daily News over the weekend — one of a series of interviews he did with Alaska media organizations — the governor explained why he believes the cuts are necessary and why he chose the path he did. “Our expenditures are out of whack with our revenues. We’re spending more money than we take in. So we’ve been, quote, deficit spending, for years now. We’ve drawn down $14 billion in savings. I think we’re down to $2 billion in the (Constitutional Budget Reserve) and the only thing left is the (Permanent Fund) earnings reserve,” the governor said. “Core services I think are defined by almost every state: education, public safety, management of resources, transportation,” he said. One of the department’s biggest duties is overseeing the state-federal Medicaid program, which provides health care to more than 210,000 Alaskans — more than 1 in 4 state residents — according to the latest available figures from the state. Of those, almost 48,000 are covered by Medicaid expansion by an executive order signed by former Gov. Bill Walker. Will Dunleavy reverse that order? “Feb. 13 will give you an answer to that and any other questions,” the governor said. Sen. Bill Wielechowski, D-Anchorage, has suggested that the state could cut some tax incentives given to oil and gas drillers on the North Slope. Eliminating what’s known as the “per barrel tax credit” could generate between $1 billion and $1.2 billion more for the state each year. The governor said he is not planning any changes to taxes at this time. The governor’s cuts will instead focus on the flexible portion of the state budget, known technically as “undesignated general funds." Last year, according to figures from the nonpartisan Legislative Finance Division, lawmakers approved a budget of $11.36 billion. Most of that is federal money passed through the state and fee-funded programs. The undesignated general fund portion of that budget, paid for with oil taxes and spending from the Permanent Fund, is $5.8 billion. At that spending level, the state’s deficit was $300 million. The amount spent on Permanent Fund dividends was $1 billion. Dunleavy has proposed increasing the spending on the Permanent Fund dividend from $1 billion to $1.9 billion. “We believe that the Permanent Fund dividend is a transfer to the people of Alaska. We believe that’s a separate account managed separately for future Alaskans. The PFD has been part of the Alaskan fabric for decades and it’s just our philosophy that people spend money better than governments. So it’s a transfer to the people of Alaska. 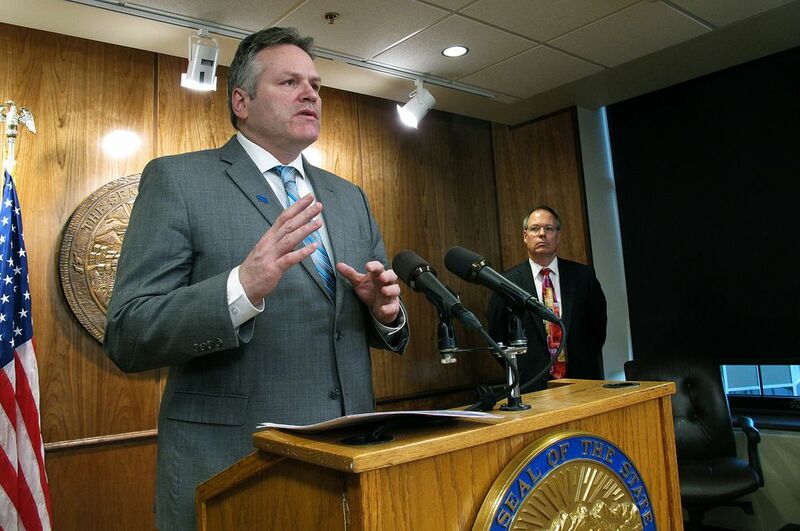 I’d like to keep that transfer in place and allow the people of Alaska to decide how they want to spend their money,” Dunleavy said. At the same time, the state’s forecast revenue is down $200 million and other expenses were forecast to be $200 million higher. Those facts, plus the previously existing $300 million deficit, result in the $1.6 billion deficit facing Dunleavy. It’s commonly agreed in the Legislature that there are four paths to solving that problem: cutting services, cutting the dividend, raising taxes (or imposing new ones), or spending from savings. The governor has ruled out two of those paths. Asked about raising taxes or imposing new ones, Dunleavy said it is “doubtful” he would agree to do so. “We are not contemplating any changes in taxes for anyone or any entity,” he said. The governor is also unwilling to reduce the dividend. “There’s lots of philosophies on the (Permanent Fund dividend), but I believe that the people of Alaska will spend their money better (than the state on their behalf). I believe that’s their money,” he said. The governor would prefer to not spend from savings. In May 2014, the state had more than $17 billion in its two principal savings accounts, the Constitutional Budget Reserve and the Statutory Budget Reserve. The statutory reserve is already spent, and by July the constitutional reserve will have less than $2 billion remaining. “In the past several years $14 billion ... is gone. I would ask people to show me what what do we have to show for it? Fourteen billion dollars, you would — probably could have provided — free electricity for folks forever. Potentially health care for some time. There’s a whole list of things you could have done with that $14 billion. It’s gone,” Dunleavy said. That leaves service cuts as the sole remaining path for the governor. Big budget cuts would have significant effects on the state’s economy. In 2016, the Institute of Social and Economic Research at the University of Alaska projected that for every $100 million in state budget cuts, between 980 and 1,260 Alaskans would lose their jobs. Those losses would come from both direct state layoffs and indirect effects. The state is in a different place than it was in 2016, however. The state’s oil-driven recession has moderated, and the Alaska Department of Labor and Workforce Development has projected that Alaska will gain jobs this year for the first time in three years. Given that, one of the authors of that 2016 paper has revised his figures: A $1 billion cut in state spending would result in more than 8,100 lost jobs, Mouhcine Guettabi wrote on Twitter. Working off that estimate, $1.6 billion in cuts would mean nearly 13,000 lost jobs. A $400 dividend would eliminate the deficit and that consequence, but the governor said that is a false choice. Without action, the state’s expenses will continue to rise.